The Sentino® Microbiology Pump is intended for microbiological evaluations of aqueous samples by Membrane Filter (MF) Technique. This unique pump is designed to use peristatlic action to draw the sample through the filter and send filtrate directly to drain or waste. 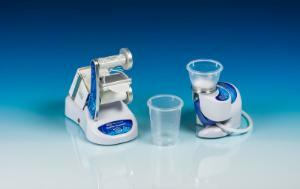 The disposable Fluid Path is made specifically for use with the Sentino® Microbiology Pump. The unique peristaltic action of the Sentino® Pump is designed around a disposable Fluid Path that can easily be replaced before biofilm build-up can cause contamination. The compact Sentino® Microbiology Pump simplifies the time it takes to prepare for membrane filtrations, frees up more lab space, simplifies testing, minimizes equipement maintenance, and provides a level of contamination control often overlooked within a lab. Ordering information: 100–240 VAC, 47–63 Hz.